Reader Contribution Du Jour Part II: Montrose Avenue Dog Doo Sign Gets Another Upgrade! I was walking to the store by my job . This was spotted on Montrose avenue and im sure u would appreciate this photo…. I have been a fan of this man’s (who I call “Super”) work for some time. This is by far the best sign he has created to date. Thanks for passing this along this great find Michael! 2 Comments on Reader Contribution Du Jour Part II: Montrose Avenue Dog Doo Sign Gets Another Upgrade! 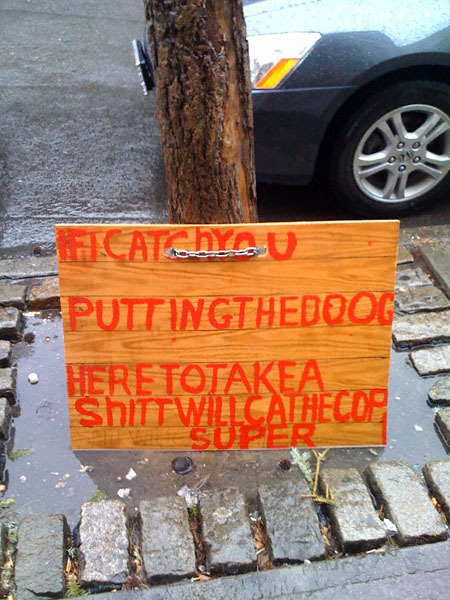 Best I can make out from this sign is that a cat is going to call the cops on a dog. Can’t they all just get along? Someone get this guy a show in Chelsea.